With the construction of a new north-south pipeline connection, Poland is reacting to the increasing local demand for gas. Part of this network expansion is the Czeszów-Wierzchowice Gas Pipeline Project in the southwest of the country. So far, only HDD technology (Horizontal Directional Drilling) had been used for crossing rivers or roads during pipeline projects in Poland. Used for decades, the method has proved its worth for large numbers of boreholes, but it reaches its technical and economic limits in heterogeneous, non-stable grounds. The sandy, sticky clay of the pipeline crossings in Wierzchowice and Czeszów presented the drilling crew with just such project conditions. Furthermore, the two alignments with lengths of 700 and 464 meters respectively run along existing gas lines. Uncontrolled deviations during the drilling process thus had to be avoided at all costs. In view of these requirements, for the first time main contractor PGNiG Technologies S.A. together with drilling contractor PPI Chrobok S.A. opted for the innovative Direct Pipe technology from Herrenknecht. This method combines the advantages of microtunnelling and HDD technology. In a single step the required borehole is created and the prefabricated pipe is simultaneously installed without a trench. Thanks to the gyrocompass navigation system which allows for an exact steering of the TBM, the drilling crew precisely installed the two pipelines with an outer diameter of 1,047 millimeters underground in just 13 respectively 16 drilling days. In doing so, they safely crossed, among others, beneath an ecologically sensitive fish pond. The sticky ground that typically tends to cause blockages is not a barrier for the Direct Pipe method. Even at very high levels of friction resistance, the 500 tonnes of thrust provided by the Pipe Thruster in the launch shaft is more than enough. Despite the small overcut of only few centimeters, no damages were detected at the coating after the pipe laying. Overall, a very positive conclusion was drawn after successful completion of the project. 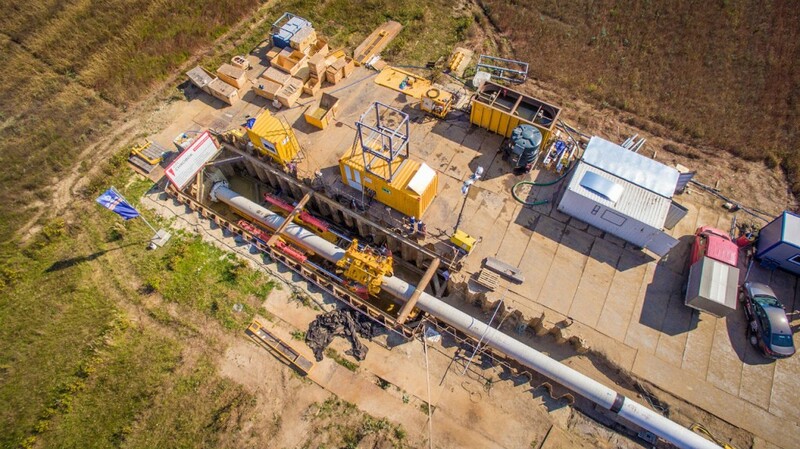 With daily best performances of 147 meters, Roland Kośka, Planning & Monitoring Manager for client GAZ-SYSTEM, summed it up as follows: "As a combination of HDD and microtunnelling, Direct Pipe overcomes their respective limitations which, to a large extent, are no longer obstacles to pipeline construction. This will also allow us to pursue new projects in the future and complete them economically, quickly and with minimal impact on the local infrastructure and environment."